Asperger’s is a type of autistic disorder in which there are problems in social interaction. There are also repetitive behaviors such as hand flapping and children may have motor developmental delays. Asperger’s children often become very obsessed and interested in one particular field in which they excel. They often do extremely well in that field and may be considered to be geniuses in that field or area. People with Asperger’s do not show a delayed development in acquiring language skills. In fact, once they find an area that they are interested in, their language becomes very advanced in that area. For instance, a child may become obsessed with dinosaurs to the exclusion of everything else. The child then knows all the names of the dinosaurs and every term that is related to dinosaurs. This may surpass the expected language and vocabulary skills of a child of that age. Motor skills are sometimes quite delayed with people who have Asperger’s being quite clumsy. A person with Asperger’s will usually struggle to interact with other people, including their peers. They may be labeled odd and distant; they usually avoid eye contact and do not know how to respond to social cues. Asperger’s individuals are usually able to live successfully on their own. There is no definitive evidence of what exactly causes Asperger’s. There is however believed to be a genetic component to most of the autism disorders. Diagnosis is not at a very young age, but usually at some stage in childhood, about 7 or 8 years of age. Other mental health conditions may occur along with Asperger’s. Conditions that may be associated with Asperger’s include anxiety, obsessive-compulsive disorder, and major depressive disorder. Treatment is limited to teaching individuals how to interact socially with other people. Cognitive behavior therapy is recommended as being useful. Certain medications such as anti-anxiety drugs and antidepressants of the SSRI type can be helpful, in alleviating the anxiety that Asperger’s people may feel. 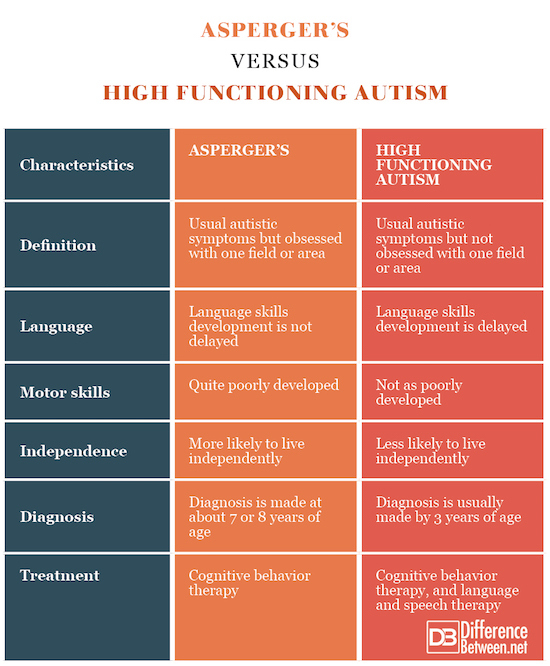 High functioning autism (HAF) is a type of autism in which there are usually significant developmental delays in motor function and language ability. Children with HAF have an IQ of 70 or higher, but they have problems with social interaction and do not understand social cues. People with high functioning autism may show repetitive behaviors such as hand flapping. Children with high functioning autism usually show significant delays in the development of language skills, including speech ability. Motor skills tend to be better developed in people who have high functioning autism compared with people who have Asperger’s syndrome. Social interaction is very difficult with individuals not understanding social cues. Individuals with high functioning autism often struggle more to live successfully on their own when compared with people who have Asperger’s syndrome. The cause of high functioning autism is still not known. There is believed to be a genetic component. There has been much speculation and theories concerning the impact of infections or environmental toxins, however, no definitive evidence has been found as to the exact cause of autism. The condition is usually diagnosed at a very young age, usually by the age of 3 years. Certain other mental health conditions can occur with high functioning autism. Obsessive-compulsive disorder, anxiety, and depression may be found to occur along with high functioning autism. Treatment is focused on cognitive behavioral therapy and is focused on managing the symptoms. Often language skills are delayed in high functioning autism, therefore speech therapy may be needed. People who have Asperger’s often become obsessed with one specific field or area while people with high functioning autism do not. People who have high functioning autism show delay in language development. 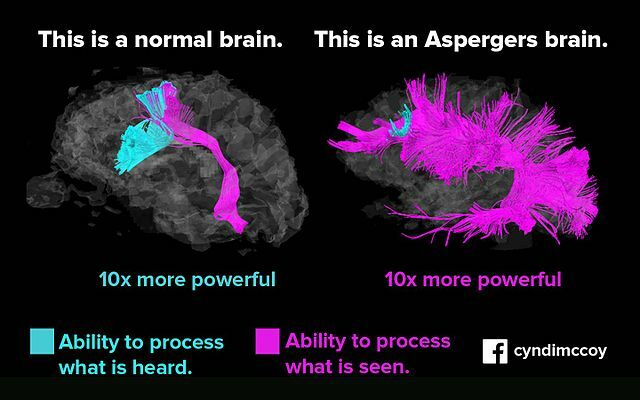 This is not the case for people who have Asperger’s. People with Asperger’s can develop very good language skills in their area of interest. People with Asperger’s tend to have a poorer development of motor skills when compared with people who have high functioning autism. People who have Asperger’s are more likely to be able to live on their own, while people with high functioning autism are less likely to be able to live on their own. Asperger’s is only diagnosed at about 7 or 8 years of age. In comparison, high functioning autism is usually diagnosed by about 3 years of age in most cases. Cognitive behavior therapy is useful for treating Asperger’s and high functioning autism. 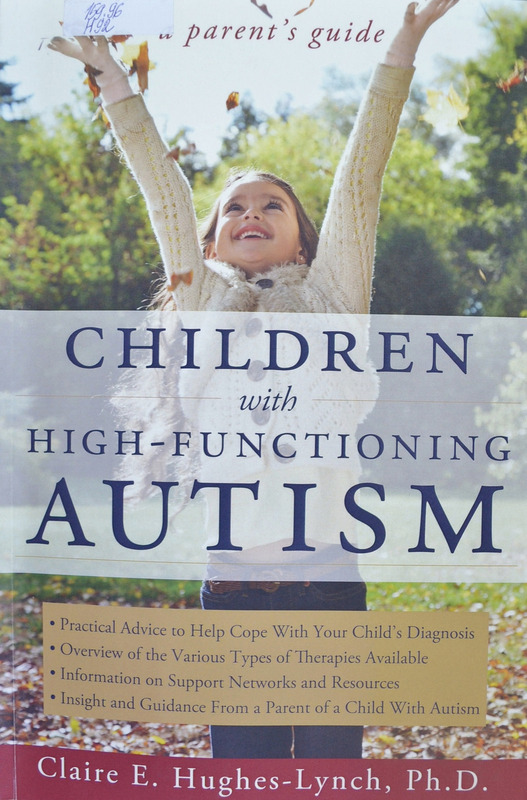 However, children with high functioning autism often also need language and speech therapy. Asperger’s and high functioning autism are both autism spectrum disorders. High functioning autism is usually diagnosed at about age 3, while Asperger’s is diagnosed in childhood at about the age of 7 or 8. Children with Asperger’s do not show delays in language development the way that children with high functioning autism do. A person with Asperger’s often becomes obsessed and interested in one specific field or area in which they tend to excel. People with Asperger’s and high functioning autism, have problems with social interactions and do not understand social cues. Dr. Rae Osborn. "Difference Between Asperger’s and High Functioning Autism." DifferenceBetween.net. August 14, 2018 < http://www.differencebetween.net/science/health/difference-between-aspergers-and-high-functioning-autism/ >. Considering the fact that the term “asperger’s” has been removed from the latest Diagnostic and Statistical Manual of Mental Disorders (DSM-5), the term appears to irrelevant today. This article seems to perpetuate the belief that asperger’s and high functioning autism are the same, when they are basically the same thing, albeit on different levels of the spectrum. You will also notice that your references using the term “asperger’s” are older than 2013 and were written before the latest DSM was released. Carpenter, Laura Arnstein, Latha Soorya, and Danielle Halpern. "Asperger's Syndrome and High-Functioning Autism". Pediatric Annals. 38.1 (2009): 30–5. Print. Wing, Lorna. "Asperger's syndrome: a clinical account." Psychological medicine. 11.1 (1981): 115-129. Print.